Confession: I may have a little problem with adjectives. When we document a wedding, I think every other word that comes out of my mouth is either "beautiful!" or "sweet!" or "darling!" And I MEAN those words with all my heart, because I fall in love with our people (and their people!) I may only get to spend a small window of time with them, in the long, long story of their lifetimes, but oh what a window it is. It's a beautiful window. It's not just any other day - it's the day two become one, and what a holy, ancient, wonderful mystery THAT is. So I'm not ashamed of my wild use of adjectives! And this Saturday, Jonathan and I will spend a very special day with sweet, lighthearted Melanie and thoughtful, romantic Tyler. The two of them are adorable, and the moment I met them, I wanted to adopt them. Look how precious they are! 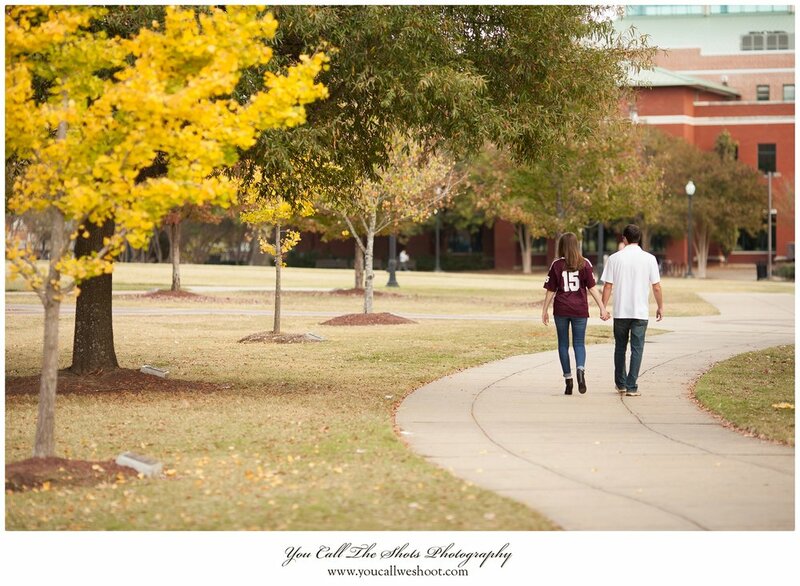 I love love LOVE cowbell engagement photos! They're almost a Mississippi State classic! MSU's campus is so beautiful in the fall. Jonathan and I loved walking with Melanie and Tyler and hearing their memories of each special spot. 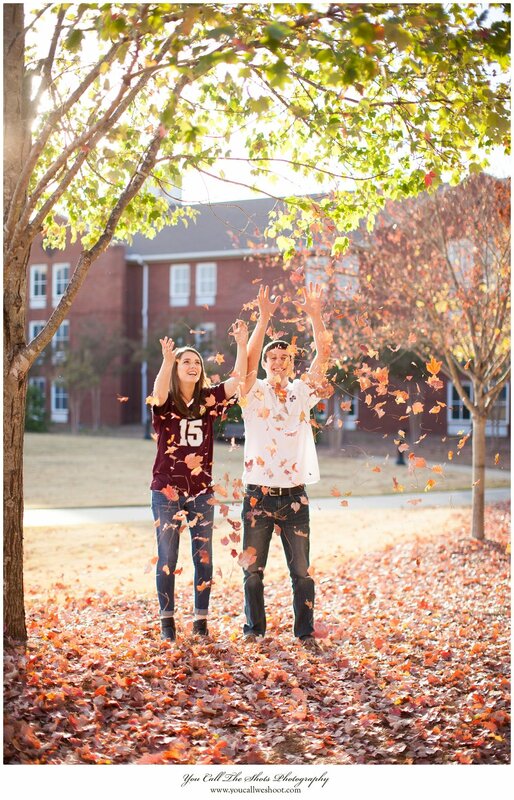 They are college sweethearts - they met their freshman year, when they both lived in Griffis Hall. Their paths crossed often, and Tyler developed a crush on the pretty girl with the bright eyes and beautiful smile. He spoke to her for the first time one evening at the North Farm, when they were out with friends, stringing Enos between the trees on the hill. Melanie asked to borrow his blanket, and not only did he let her borrow it, he tucked her in. (If you'd like to read the rest of their love story, including how Tyler surprised hard-to-surprise Melanie with his proposal, you can read it here.) I loved how they incorporated these wonderful memories into their engagement session! Every couple needs their own version of an Adventure Book. I love that Melanie and Tyler have already begun to fill their pages with stories. Melanie and Tyler, even though you don't feel like you two are "picture people," you totally made our day with your session! We enjoyed seeing the campus of MSU and the North Farm through the lens of your precious memories. It was a joy to spend that afternoon with you, and we cannot wait to see you two say "I do" in just two short days! Happy Wedding Week!